This post will interest maybe three people in the entire world, my brother James and friend Louise who work for TfL, and Tass, who was with me on the trip to Shanghai. Apologies to everyone else. My degree in human geography, with a heavy focus on urban issues, my interests in cycling and liveable cities, my curiosity with trains, and my annoyance at inefficiency has made me very aware of transportation issues within cities and when travelling between cities. As a European I am, rightly, proud of the high-speed rail network invented, designed, built and operated across my continent. The high-speed rail network now stretches from southern Spain and Italy to France, Germany and Scandinavia, and it even has a short branch-line to London. However, high-speed rail’s detractors say that it is still based on 200-year-old technology – steel-wheel on steel-rail – and cite magnetic levitation as the next big technological leap. MagLev, they claim, can achieve higher speeds and a smoother ride as there is no physical contact between the train and track. Despite the enthusiasm, maglev always seems to be about a decade away from adoption. Currently, there is only one commercially operated maglev passenger line in the world, from Shanghai Pudong International Airport towards the centre of Shanghai. Having ridden the maglev train from Shanghai airport, I feel I can now make an informed comment about the future of the technology. In short: it has no future outside of vanity projects. I’m currently writing this (although I posted it later…) on the high-speed train from Shanghai to Qingdao. The train is a modified Siemens Valero on a newly constructed line. It has a design speed of 380km/h, but has reached 457km/h in trials. We’re currently travelling at 310km/h, and the train is so smooth that apart from the scenery flashing past the window at an outrageous speed, I wouldn’t know we were moving. There is not much noise, if it was within the Chinese character to speak softly in respect of other people’s peace and quiet, it would be possible to have a whispered conversation. Compare this to the maglev. The train left the station bouncing up and down, I presume as it passed over different sets of magnets to keep it aloft. It accelerated quickly, but so did the frequency of the vibration from the magnet sets. The noise, while not loud, was still much greater than on the traditional train, and the top speed is only 50km/h faster than the traditional high-speed train. In fact, the top operational speed, at 431km/h, and even the record maximum speed of 501km/h, is lower than the world-record top speed of the TGV in France, at 515km/h. So the benefit is the false promise of a smoother ride and faster speeds, and the disadvantages are many. Traditional trains cannot use maglev tracks, and maglev trains cannot use traditional tracks. There is no hybrid solution, so any maglev system has to be completely segregated from the existing rail infrastructure. Why is that a problem? Well, a high-speed train can use low speed track when it’s more convenient. Instead of rebuilding the last 10 km of infrastructure into the city centre, the train can run at lower speed and share the network with ordinary trains. A maglev train would require completely new infrastructure right into the station, which then couldn’t be used by the existing trains. This is the reason why I wrote that the line in Shanghai goes “towards the centre of Shanghai” – it actually stops at LongYang metro station, which is nowhere useful, and you then have to continue your journey by traditional metro train. Ordinary high-speed trains are a developed and proven technology, the infrastructure to build the infrastructure, if you like, is already in place. There are three or more different designs of train, from Alstom, Siemens, Hitachi and others, with those companies competing to produce the best trains for the lowest prices. The factories producing the rails and sleepers are already operating. The signal technology has been developed and is in use. The maintenance routines and service schedules of the equipment is known and quantifiable. With maglev, although there is the passenger line in Shanghai and various development test tracks around the world, these are very much small scale proof-of-concept lines and not enough is yet known about the long term service reliability of long distance lines and trains in constant use. So, my conclusion. Maglev is dreamy vanity technology, but with no real future. I promise I haven’t forgotten about the blog over the past two weeks. I keep trying to write blog posts about interesting things, but I just don’t seems to be able to articulate anything at the moment. Normal service will resume again just as soon as I manage to take the muddle of thoughts in my head and transform them into a coherent piece of writing. Over the past week I’ve tried twice to write a post about “no why”, the frustrating answer I usually get when I ask a “why” question about life in China. The first attempt was just crap, and on the second attempt I went off on a complete tangent into design theory. I thought and wrote enough about design that sometime I’ll do a full post on that including, for instance, why I had a USB memory stick sent from the UK instead of just buying one here. I also have the third and final post about Shanghai to finish, which is becoming more urgent as I’m going on holiday again in a week so will have lots to write about then. I would upload photos of my trip to the park with my class, but with posting photos online, I’m currently in a weird half-way house between Flickr (which I’m moving away from), SmugMug (which is much better than Flickr and I was moving to, but which I’ve quickly become disenchanted with), and some gallery software on the same server as my blog (currently I’m thinking probably ZenPhoto, but I’ve changed my mind three times in three days). So you’ll just have to wait until I’ve finalised my longer-term online photo strategy. Anyway, yeah, good things come to those who wait, right? 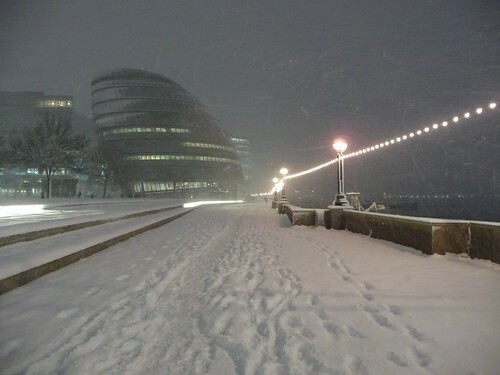 If you’re in London, there’s a good chance you know this already: it snowed in London! All the buses were cancelled, most of the tubes and trains weren’t working. So I walked to work, leaving at 6:40am, and arriving at my usual time of 8am. Along the way I took a lot of photos – click the photo below to see the rest of them. Woo! The US finally has a new president, and my brother graduated with his masters. How annoyed am I that I was on the tube and couldn’t get to a tv at the time he gave his oath of office? Very. Still, today is a good day. 2009 already. My resolutions: stop buying lunch and make it at home instead; stop buying breakfast and have it at home instead; don’t spend any money unless actually needed; stop smoking; update blog more often.